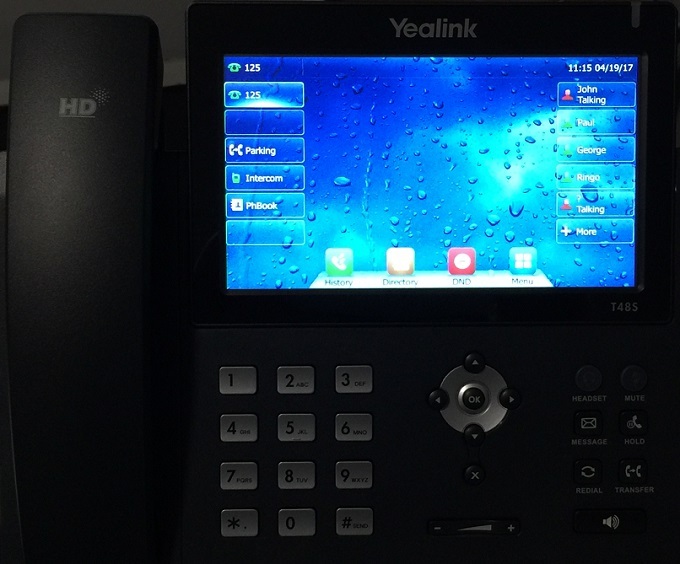 The Yealink T48S is a high-end business IP desk phone primarily aimed at executives. It is very stylish with its large touch screen display and supports High Definition (HD) audio using the Opus Codec. 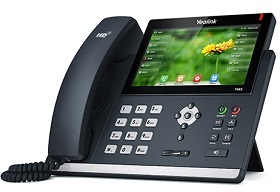 In this review we are focusing on the pros and cons of the Yealink T48S IP phone and look at the steps necessary to install and configure the device. Let's start with the looks. The T48S looks very modern and stylish on a desk and has a very professional and polished look. It would look good on any executive's desk. The display is a 7 inch touch screen color display with a 800x480 pixel resolution and is back-lit ensuring it looks sharp under all lighting conditions. The touch screen capabilities should not be ignored as it allows one to add multiple line buttons to your phone through touch, in fact 29 one-touch DSS keys are available on the display. This helps give the phone its sleek appearance as it removes the need for line buttons on the sides of the display. Yealink's User Interface (UI) is very intuitive and simple to navigate. You can access most settings direct from the phone, for example setting up the DSS keys, configuring network and WiFi parameters and changing screen savers and desktop images. The T48S includes two Gigabit Ethernet ports which helps future proof this IP phone. It also has a USB 2.0 connector which extends the functionality of the T48S. For example you can plug in a USB flash drive and use it for call recording, or connect a Bluetooth adapter (BT40) or even a WiFi adapter (WF40). The Bluetooth is useful to pair with cell phones or for wireless headsets. We tested the WiFi adapter and it was simple to setup and connect to our wireless network, which is useful if you have no wired Ethernet access nearby. Voice quality is outstanding, something we have become accustomed to with Yealink phones. It supports all of the standard audio codecs including Opus, which is the main addition to the T48S when compared to the T48G. Opus is a completely open source standard so there is no license fee to use it. Also it is true High Definition (HD) audio and the scalable rates (8KHz narrowband and 16KHz wideband sample rates) ensure great quality audio even when network bandwidth is reduced (i.e. slower Internet connections). It is also Hearing Aid Compatible (HAC). An expansion port is provided giving the ability to extend the phone with up to 6 expansion modules. This would provide up to 240 additional buttons. By connecting the optional EHS36 adapter to the EXT port on the back of the phone, wireless headset base stations can be connected to the phone in a plug and play manner. The speaker phone on the T48S is reasonable but certainly not as clear as the audio when using the handset. This is true for most speaker phones but for a higher end device I was expecting a little more quality. Reducing the speaker volume certainly helped. In administrator mode, the UI provides access to many of the system parameters that are needed in order to register an extension. However, it does not provide access to the transport protocol (e.g. TCP, UDP etc). If this was added, one could easily manually configure an extension for most scenarios. If you need to change the transport you will have to use the web portal for the phone. In fairness, it does offer access to auto provision server fields which is very useful. Only 10 wallpapers are available in the display settings. An easy way to upload new wallpapers from a USB2.0 memory stick would be a nice feature to add, thus save time logging into the phone portal on a browser and uploading custom wallpapers. Modern and stylish IP phone at a reasonable price (approx $220). 7 inch touch screen color display (800x480 resolution). Up to 29 one-touch DSS keys. Supports up to 16 SIP accounts. WiFi and Bluetooth optional through WF40 and BT40 USB adapters. Support for Opus HD quality audio Codec (narrowband and wideband). The Yealink T48S is an excellent IP phone with a sleek appearance and a highly intuitive interface. The touch screen capability provides an abundance of options in terms of programmable DSS keys, such as line buttons and BLF keys which would likely benefit any executive or receptionist. Expansion options exist for extending the number of line buttons, adding Bluetooth headsets, WiFi access or even Flash drives for call recording. Yealink has listened to its customers needs and responded with a feature rich phone at a very reasonable price. Yealink T48S phone, handset and cord. Power supply optional - note Power over Ethernet (POE) is default. Setting up the Yealink T48S is very straightforward. Simply connect the phone as per the quick start guide that comes with the phone. All it needs is the handset connection to the phone, an Ethernet cable to your network and plug in the optional power supply, if you do not have a PoE switch. For the purpose of this review we will simply manually configure the phone with the extension credentials, using the display on the phone rather than logging into the phone portal with a Web browser. If you wish to use the Web browser, follow the instructions in one of our other Yealink review pages, such as the Yealink T46G since it is very similar. When the phone is powered up (usually takes a minute or two) press the Menu icon on the touch screen and then the advanced icon. It will usually ask for a password - the default password for Yealink is admin. Make sure the correct character mapping is set (i.e. abc) and use the phone keys to enter admin i.e. press 2 once to get the letter a, 3 once to get the letter d etc. Press OK when done. This will take you into the advanced menu. It usually defaults to Account, as the first menu selection on the left hand side. Press on Account 1 and you will be able to add the credentials for this extension, so it can authorize successfully with your VoIP service. There are 2 pages of settings, as highlighted in Figure 1 and Figure 2 below. Label - Enter a label for this account (e.g. 125). Display Name - Enter any display name (e.g. 125). Register name - From the service provider (extension number usually) (e.g. 125). User Name - From the service provider (extension number usually) (e.g. 125). Password - From the service provider. Password for this extension. 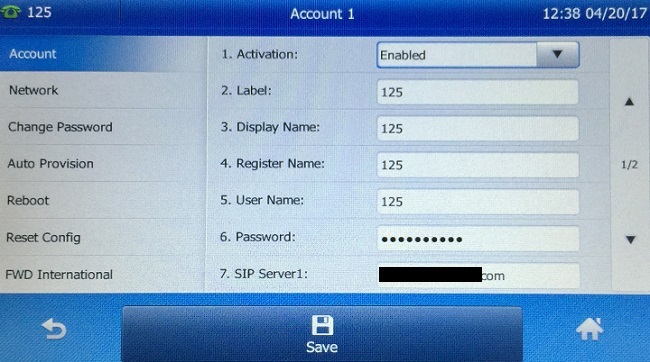 SIP Server1 - This is usually a sub domain for the provider's server (e.g. pbx1.myprovider.com). 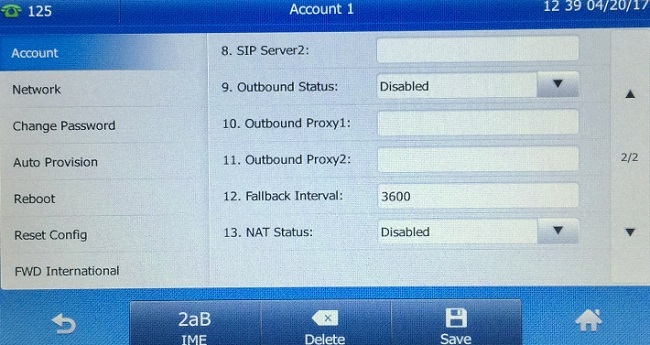 SIP Server2 - This is usually a sub domain for the provider's redundant server (e.g. pbx2.myprovider.com). NAT Status - Network Address Translation. Depends on your needs here but typically disabled. Press the Save button when done and if you entered the credentials correctly the account should register with your service provider. You can tell if registration has been successful as the little phone icon will turn solid green for this account on the home screen. It flashes green when trying to register. You are now ready to make some test calls. In our in-house testing PBX we added a few extensions and made some calls between extensions. Everything worked as expected as shown in Figure 3 below. Note the use of Busy Lamp keys (BLF) on the display. BLF functionality is very useful for businesses so make sure your provider supports this feature. It provides an easy way to pickup calls for other extensions, speed dial another extension with one touch, transfer calls to another extension with one touch and presence detect, in other words, see if someone is busy before calling them. If you have questions or comments, please use the Q&A tab at the top of this review. We're sorry, there are currently no user submitted reviews for Yealink T48S matching your search criteria at this time. Please add your own review or check back later as reviews are being submitted often.